Greece is known for fabulous lamb dishes, from small souvlaki (skewered kebabs) to stuffed baby lamb to spit-roasted whole lamb – and a lot of grilled, roasted, and stewed recipes in between! 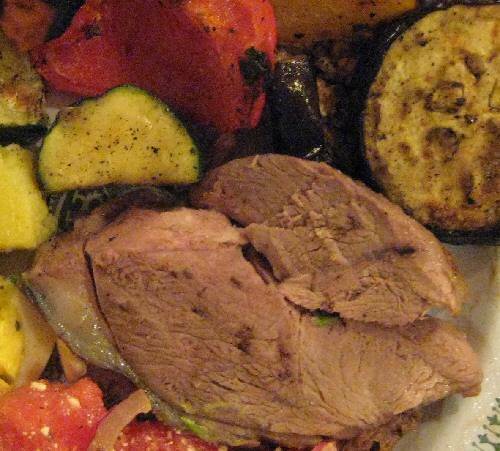 Learn more about cooking with lamb. What is baby lamb? Spring lamb? Young? Mutton? When shopping for lamb (1 year and under), look for pale, tender meat. It should have a fine grain and any fat (on roasts) should be white and crumbly. Red meat indicates an older animal. 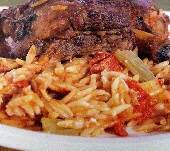 What about Greek recipes for lamb chops? Greek recipes for paithakia (or paidakia) refer to small rib chops. A “rack of lamb” is the entire set of ribs (usually 8). These small ribs can be purchased or served “single cut” (one rib bone) or, especially when very small, “double cut” (2 ribs); however, in most Greek recipes other than the full rack, the ribs are single cut. because ground lamb is considerably softer than ground beef, take care when breaking into small pieces. Use a wide-tined fork and take care not to mash the meat. Ground lamb can have a strong smell and taste that may not be quite to your preference. In stews, ragouts, and other casserole type dishes, using chicken broth or stock instead of water will help dampen the strong smell and taste. Smaller roasts will shrink more than larger, so when cooking large roasts, you can calculate a slightly smaller amount of uncooked weight per person. Experts say that the best size lamb for roasting whole on a spit is around 22-25 pounds (10-11 kilos). Cooking time is 3-5 hours.